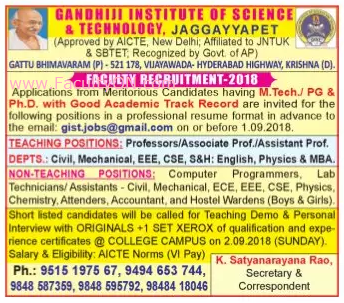 Gandhiji Institute of Science and Technology, Krishna has advertised in the SAKSHI newspaper for the recruitment of Teaching Faculty- Professor / Associate Professor / Assistant Professor Plus Non-Faculty jobs vacancies. Interested and eligible job aspirants are requested to apply on or before 01st September 2018. Check out further more details below. M.Tech / PG & Ph.D with good academic track record. How to Apply: Interested and eligible candidates are requested to send CV along with copies of certificates / mark sheets, copy of Aadhaar card, copy of PAN card and recent PP size photos to the following email address.